The first cold snap has arrived requiring jackets to come out of the closet and heaters to be turned on for the first time this winter. Many of streets throughout the city are being strung with lights for the upcoming holiday season, but they won't come on for another week or so. Just like in the states, Christmas here kicks off after a long weekend, but its not Thanksgiving, rather it's Constitution day (Dec 6th) followed by the Day of the Immaculate Conception (Dec 8th) with December 7th being un puente or bridge. The main Christmas fair in Barcelona is La Fira de Santa Llùcia (Lucia) located outside the Gothic Cathedral. Inaugurated in 1786, hundreds of small wooden stands sell Christmas decorations, ornaments, reefs and trees to the many, many people strolling around checking out the scene. I remember as a kid back in the states, getting and decorating the tree was the center of attention, but in Spain it seems to be the nativity scene with hand crafted figurines and well built mangers also being prominently displayed throughout the market. The local addition to the picture of Mary holding the baby Jesus with Joseph, the Angel and the Three Kings looking on between an ox sheep and a mule is el caganer, or the shitter. 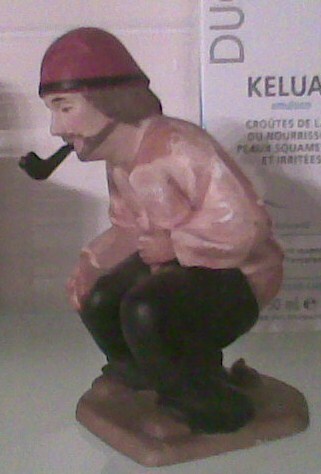 As the picture shows, the traditional one is a peasant, who with the aid of a pipe and a paper, is planting a pine. But this pose is also given to certain celebrities and political figures each year with past honorees being Obama, the Pope, and Messi. December 22nd sees El Gordo, or the fat one, the biggest lottery in Spain while Christmas Eve is known as la noche buena or the good night. Kids in Catalunya gather around a cagatió (a small wooden log with a smiley face paint on one end and sometimes smoking a pipe) feed it and then lightly tap it with a stick as they sing a song so it can literally crap out candies and small presents similar to what we call stocking stuffers. The most common is a turrón, which is a large bar of almond nugget. Traditionally Christmas day hasn't been the main moment to exchange gifts, with the day reserved for a big meal with family and friends. The typical dish in Catalunya is escudella, which is a slowly cooked soup that uses the various blood sausages or butifarra found in the region and a base of broth and la pilota (egg, pepper, ground cinnamon, chickpeas and bread crumbs), plus other ingredients depending on a family's recipe. Canelones using left over meats, ham and if you want chicken covered in a tomato sauce are then consumed on St. Steven the 26th. The 28th of December is the Day of the Innocence, or Spain's April 1st and a time for pranks while the gift exchange waits until after the New Year and specifically, Los Reyes Magos (The Magic Kings) or January 5th. There's an elaborate parade that's well worth going to. Full of beating drums and flashing sparklers, it follows the Three kings from the port to Montjuic mountain as they toss out fruit flavored candy to the waiting kids and eager grandparents, making it like a little person's Mardi Gras that marks the end of the Christmas season in Spain and all public holidays until Easter!